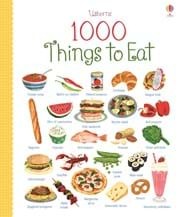 A colourful and tasty look-and-talk book to improve children’s vocabulary by introducing them to a wide range of food-related words. With 1000 pictures to spot and talk about, from raw ingredients such as fruit and vegetables to delicious dishes from around the world. Food is divided into sections such as the store cupboard, the fishmonger, a Chinese restaurant and more. A great book to share and talk about with a small child, and help them build their vocabulary.